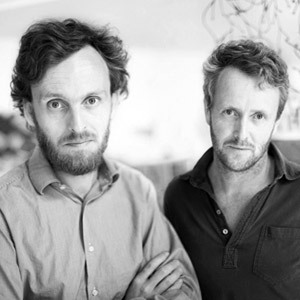 Ronan (born 1971) and Erwan Bouroullec (born 1976) are brothers and designers based in Paris. They have been working together for about twenty years bonded by diligence and challenged by their distinct personalities. In 1997, they were spotted by Giulio Cappellini, giving them their first industrial design projects. Since then, they have worked with Established & Sons, Vitra, Magis, Alessi, Kvadrat, Kartell, Ligne Roset, Nani Marquina, Mattiazzi, Mutina and Flos. From designing spaces to furniture, taking on architectural projects to designing textile wall systems or comprehensive collections, the designer brothers maintain experimental activity with Gallery kreo. Designs of the Ronan and Erwan Bouroullec are part of select international museums - permanent collections such as the Musée National d'Art Moderneand the Musee des arts décoratifs in Paris, the Museum of Modern Art in New York, the Art Institute of Chicago and the Design Museum in London.